This is a sponsored post from Ovo Energy – the cheaper, greener and simpler energy supplier. See my disclosure policy for more information. I’ve written a lot about easy ways to save energy, and today I’ve got a great infographic that rounds up some of the easy ways you can save energy and money at home, especially in the kitchen. There are also some other great savings outlined if you’re planning on replacing your kitchen appliances any time soon – I knew that gas ovens and hobs were more efficient than their electric counterparts but not to the tune of £48 a year more efficient! 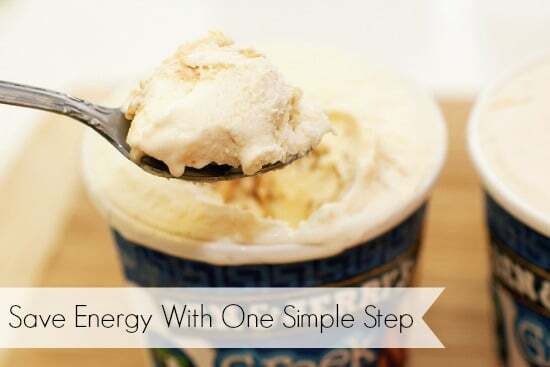 Are you missing the weekly Save Energy With One Simple Step posts? I was, and seeing as it’s Thursday I thought it would be a good day to share with you my tip number 10 in this now occassional saving energy series. As always, all my tips for saving energy are really easy to do, without the need to buy the latest gadget or technology, and so won’t cost you any money. In fact you’ll save money at the same time as saving energy, which is always good! Defrost your freezer, especially if it’s looking a bit glacier like in there. I know it’s a total pain in the bum to do. We did it last week, and without the luxury of a second freezer to store the food in, it meant that in the run up to the big defrost we had to eat everything up that was in the freezer. We unearthed 40 (yes, forty, thanks to an internet shopping mix up!) vegetable fingers that we had to eat up. Now I don’t think I can look at another vegetable finger without feeling more than a litte nauseous. It needed doing though – frost buildup in your freezer increases the amount of work your freezer’s motor has to do, which means it’s using more energy. Keeping it fairly frost free means savings for you and the environment. My tips on how to defrost a freezer are quite straightforward – you’ll need lots of towels to protect your floor and a dish shallow enough to sit under the freezer’s drainage spout that you’ll be prepared to empty frequently. I’m also a fan of placing bowls of hot water inside the freezer to help move things along a bit. My last, most essential piece of advice is, however tempting it may be, do not under any circumstances hack at the ice with a knife, hammer or anything else. Instead have patience and just leave the ice to melt, rather than risk puncturing your freezer pipes.